Matthew Speelman joined the Huntingtown Volunteer Fire Department and Rescue Squad in the latter part of 2016, yet responded to 203 calls for service; in 2017, he made 1066 runs; and in 2018, an outstanding 1836 responses, totaling 3,105 responses in his short term at Company 6. Matthew was awarded Firefighter of the Year, in 2017, and Emergency Medical Technician of the Year, in 2018. Even in his spare time, he balances family plans and events with his responsibilities at the station. Being a live-in member, Matthew comes home from his full time job to staff Huntingtown Volunteer Fire Department’s ambulances daily. 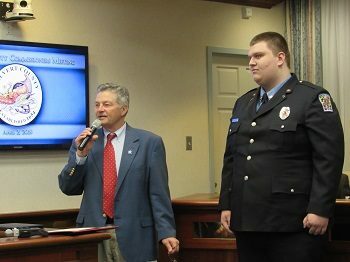 In 2018, Matthew received credit for more than half of Huntingtown Volunteer Fire Department and Rescue Squad’s responses. Calvert County citizens have benefited from Matthew Speelman’s dedicated service to Company 6. He has earned the respect and admiration of his public service constituents through his skills, knowledge, and dedication. 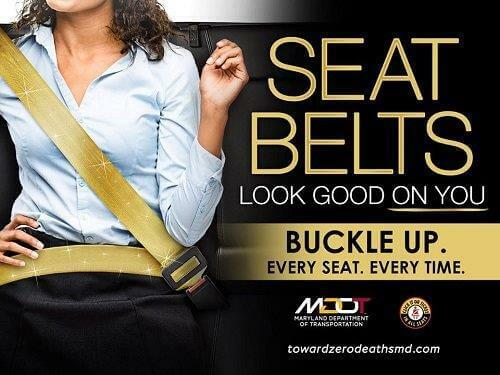 The Calvert Board of County Commissioners (BOCC) desires to recognize citizens who are dedicated to improving the quality of life in Calvert County and Southern Maryland. 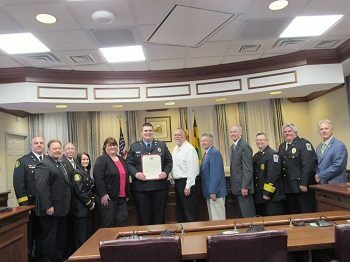 The Calvert Board of County Commissioners at their meeting on April 2, 2019, proclaimed that recognition and appreciation of all Calvert Countians is hereby extended to Matthew Speelman for his extraordinary service, civic accomplishments, and commitment to enriching the lives of Calvert County citizens, as a volunteer public servant, as well as a friend and neighbor. The commissioners further proclaimed that by this action it shall stand as a tribute to the character and strength of this amazing volunteer. Congratulations, Matthew Speelman, for a job well done!